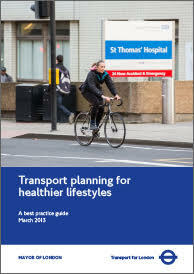 In London, the health sector accounts for around one million daily trips or nearly 5% of all trips and there are many ways in which health and transport are linked. Sustainable transport modes such as walking and cycling have positive health benefits and facilities can be planned to maximise the use of sustainable travel. Access to facilities and services can be improved through effective planning around public transport. Other health impacts of travel include traffic accidents, noise and air pollution and access arrangements for emergency services. 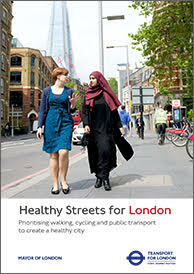 The Healthy Streets approach is intended to help improve air quality, reduce congestion and make London’s diverse communities become greener, healthier and more attractive places in which to live, play and do business. It provides a framework for policies and strategies to achieve this, including ten key indicators for judging success. For help in identifying and applying good practice in line with the approaches set out in the guides see Our Services – Information & Analysis.